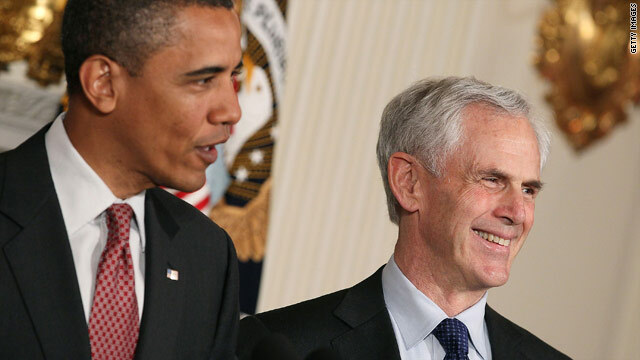 President Obama announced his choice to lead the Commerce Department on Tuesday, selecting John Bryson, the former CEO of the utility company Edison International, CNNMoney's Charles Riley reports. THE PRESIDENT: Good afternoon, everybody. Today, I am pleased to announce that I will nominate John Bryson to be our nation’s next Commerce Secretary. John is somebody who will bring to this job a wealth of experience in the public and in the private sectors. But, in my mind, nothing has prepared him more for this demanding role –- a role that requires delicate diplomacy, complex negotiations, and careful management of folks with strong views -– than being the father of four daughters. They’re all here today, as is John’s wife, Louise. And I’m sure John agrees that Louise gets the credit for how wonderfully they have turned out. As Commerce Secretary, John is going to be an important part of my economic team, promoting American business and American products across the globe. By working with companies here at home, and representing America’s interests abroad, I’m confident that he’s going to help us meet the goal that I set of doubling our nation’s exports. In this new role, John will be able to draw on decades of business experience across a range of industries -– from his role on the boards of major companies like Disney and Boeing, to his leadership in the clean energy industry. That’s the expertise that will help us create new jobs and make America more competitive in the global economy. Of course, John will be building on the success of outgoing Commerce Secretary Gary Locke, who has tirelessly advanced America’s economic leadership abroad, securing export deals that will mean hundreds of thousands of jobs here in America -– including an agreement with China, where Gary will now be serving as our next ambassador. And we couldn't be prouder of him and we're confident he is going to be doing an outstanding job there. Of course, in the years ahead, a key to achieving our export goal will be promoting clean energy in America. It’s how we’ll reduce our dependence on foreign oil. And that’s how we’ll encourage new businesses and jobs to take root on our shores. John understands this better than virtually anybody. Throughout a distinguished career in which he’s led nonprofits, government agencies, and large companies, he’s been a fierce proponent of alternative energy. As a young man with a degree in hand from a prestigious law school, John didn’t follow his friends to a blue chip law firm. John took a chance on an idea he cared about, and co-founded the Natural Resources Defense Council, which grew into a powerful and important voice in protecting the safety of our air and water. It was then that John caught the eye of a young California governor named Jerry Brown. I’m not sure what happened to that guy, but - (laughter) - but for John it led to leadership positions in government, where he got a firsthand look at the real-life impact of energy and environmental policies, from water conservation to electricity production. Later, in the private sector, he rose to become the Chairman and CEO of Edison International, one of the nation’s largest utility companies. John headed the company for almost 20 years, during which time he helped Edison become a leader in solar and wind power, and innovative approaches to proving the profitability of clean energy. Just before he retired from the company, he launched a plan to turn 65 million square feet of unused commercial rooftops into solar power stations, the largest array in the country, with enough electricity for more than 160,000 homes. Today he advises companies around the world as a business leader who understands what it takes to innovate, to create jobs, and to persevere through tough times. And he continues to carry himself with the integrity and sense of responsibility that have guided him his entire life. This experience and these qualities will serve our nation well as John takes on yet another tough assignment in his career. So I want to thank Gary again for his extraordinary service. He has done an outstanding job while at Commerce. And, John, I am grateful to you for your willingness to serve. I look forward to working with you. And I know that you will help us deliver the kinds of growth, prosperity and job creation here in America that we all want. So, thank you very much, both of you. MR. BRYSON: Thank you very much, Mr. President. MR. LOCKE: Thank you, Mr. President. It's perfect time to make some plans for the long run and it is time to be happy. I have learn this publish and if I may I desire to counsel you some interesting issues or advice. Maybe you could write next articles regarding this article. I want to read more things about it!